Regarding your dental health, have you come across something called sealants? If you have not, better you know about them because the information may be helpful to you to protect your teeth from cavities. Therefore, Apopka, FL dental experts share here information about dental sealants. A sealant is a painless and safe material to protect your teeth from cavities. 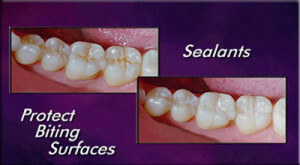 Sealants are plastic coatings that are applied to the chewing surfaces of the back teeth, i.e. premolars and molars. These sealants create a hard covering over the teeth and prevent tiny food particles and bacteria from getting trapped into the grooves of these teeth and thus protect teeth from decaying. Which Teeth are Normally Sealed? Sealants can be applied only to the back teeth because only these teeth have fissures (small grooves) and pits (hollows) on them. After examining your teeth and checked if fissures on them are sufficiently deep to hold sealants, your dentist will tell you which of your teeth should be applied sealants. Some teeth have shallow grooves which need not be sealed, while others have deeper ones and so, should be sealed. Sealing teeth is a fairly simple and quick procedure performed within a few minutes per tooth. First each tooth to be sealed is completely cleaned and prepared with a specialized solution and is allowed to dry. Then the liquid sealant is painted and is left to set hard, often by casting a bright light on it. No, a sealant is not felt, is painless and you won’t feel anything even afterwards. The sealant will normally last for several years; still, you should visit your dentist regularly to ensure if it is intact. Sealants can wear in the long run and sometimes more sealant may have to be added or replaced to prevent any decay that can start beneath it. Sealants are liquids and so, when they are applied, they form a coating over the small grooves and fissures on the tooth surfaces. Later they are dried and become hard. Thus they form a barrier over the teeth surfaces. If these grooves are not protected by the layer of sealant, food particles may remain entrapped in them and bacterial growth may take place, starting tooth decay. Teeth are protected by sealants normally right upon the emergence of first permanent teeth, which is at the age of around 6 or 7 years. The rest are often sealed once they start appearing which is usually from 11 to 14 years of age. However, it’s not necessary to apply to only children; adults too can have them and protect their teeth from decaying. Is it Necessary to Clean My Teeth Keenly after Sealing? Yes, cleaning teeth keenly is important because sealants cannot be applied to the sides of premolars and molars. So, these surfaces should be kept clean regularly. Cleaning the biting surfaces that have now become smooth with the sealants is much easier than before. Visit Local Dental Clinic Directory to find out a dentist in your area and get your teeth checked regularly for keeping your oral health in top shape always.